We are manufacturers & exporters of Heat Treatment Furnaces. 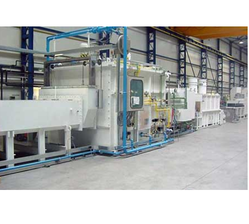 Our high quality Heat Treatment Furnaces are customised in nature and follows industry standards. With the passage, we have also specialized in gas atmospheres in Heat Treatment Furnace and experienced ourselves in mesh belt type continuous type of Furnaces for Sintering, Brazing & Annealing and our contribution has been quite useful for our esteemed customers.We could help them in terms of lot of energy & cost savings to wards gas consumption and later enter in to designing of these Furnaces. Our Heat Treatment Furnace are og high quality & customized in nature.